Mile High United Way’s Power Lunch program truly changes lives. In Metro Denver, a majority of third grade students are testing below grade level in reading. * This means they are 24% more likely to drop out of high school and 70% more likely to be arrested for a violent crime later in life. ** Power Lunch volunteers, like Khalil, step in to help change that statistic. 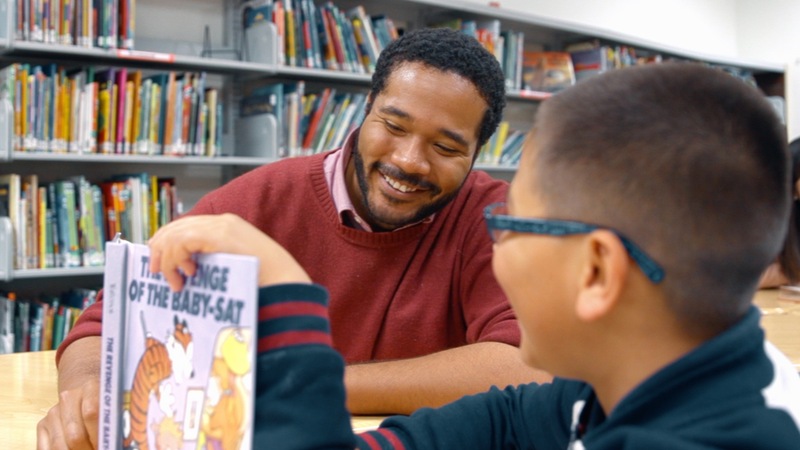 By making a commitment to their buddies, they help foster a love of reading and build a positive relationship with students who might not otherwise receive one-on-one attention from an adult. Khalil moved to Denver two years ago from New York City. Though he moved to Colorado for work, he wanted to find a way to make this place his home. As the son of immigrants, finding ways to make a difference in his community has become his passion, and he was intent on making his presence felt in his new city. That’s why Khalil volunteers with Power Lunch. When kids develop a love of reading, they are better equipped to take ownership over their own education and growth. Strong literacy skills are more than just a grade – they are self-empowerment. “So much of my success now traces directly back to the folks who helped me fall in love with learning. I feel lucky that I’m in a position to do the same for someone else now, and I feel really good investing in Denver’s future through its most important citizens: the kids,” says Khalil. Learn more about the Power Lunch program today and see how you can change a life.